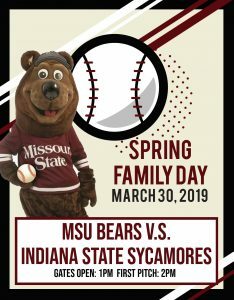 Make plans to join Parent & Family Programs for the 5th annual Spring Family Day at Hammons Field on Saturday, March 30th. Head to campus to enjoy time with your student, cheer on the Bears Baseball team as they take on Indiana State at Hammons Field and explore Springfield. Visit the Family Association website to see a full listing of campus activities. Hammons Field, Saturday, March 30th, 2:05 pm (first pitch) Gates open at 1pm. Deck out in your BearWear and join us in cheering on the Bears baseball team as they take on Indiana State. Tickets are $14 for adults , $12 for students and children (ages 2-12). The ticket price includes a Spring Family Day T-shirt (picked up at the game). Download the ticket order form here: 2019SpringFamilyDayOrderForm. Complete the form and return it to the JQH Ticket Office or email the form to duanemiller@missouristate.edu. The deadline to order tickets that include the t-shirt is March 20th. Want to get in some exercise, play a game, or take a quick swim? Visit the Foster Recreation Center and take advantage of the brand-new facility! Family members will be admitted free when accompanied by their Missouri State student. *With signed consent, all family members are welcome to use the courts and pool, and those 18 and older are invited to utilize the fitness equipment. Join your student for breakfast at Blair-Shannon Dining Center or lunch at Garst Dining Center. Choose from a wide variety of cuisines and enjoy the decorative scenery as you indulge in a delectable eating experience. Students invite their family to join them and two family members eat for free! Spend some fun time bowling, playing pool and ping-pong with your student at Level 1 Game Center. Bowling costs $2 per game with a BearPass or $3 per game without one. Shoe rental is $1 with a BearPass and $1.50 without. Stop by the Missouri State Bookstore, located on the Missouri State campus, and pick-up some cool new BearWear. You can also shop the Bookstore at the baseball game starting at 1pm at Hammons Field. In theatrical terms, a sightline is the hypothetical line from an observer’s eye to the subject on stage. Good theater design and staging allow unobstructed views of the central action so the audience may experience the full aesthetic impact of the performance. This year’s Spring Dance Concert explores the broader connections between spectators, performers and creators of dance compositions. Going beyond the visual definition of sightlines, these original pieces represent unique perspectives and invite individual interpretations, extending sightlines from the eye to the human psyche. Come experience the beauty and diversity of dance expression and the multilayered meaning of Sightlines! Visit https://www.facebook.com/events/571654496600704/ for ticket info and performance times. If you have questions about Spring Family Day, contact Priscilla Childress at (417) 836-3060 or at pchildress@missouristate.edu. We look forward to seeing you at Spring Family Day 2019!